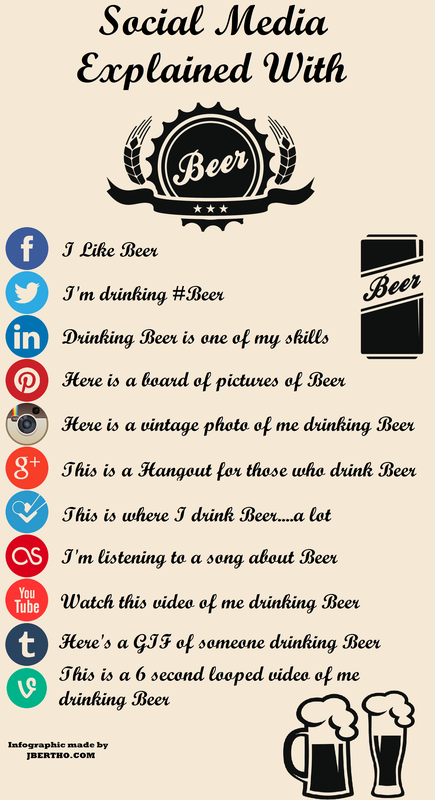 Inspired by both the bacon and hockey infographics I’ve posted previously on this blog, I decided to create my own handy infographic explaining social media with beer. I’m not artistic (at all), so feel free to critique any design elements below, but this is a comprehensive guide that also includes the content publishing platform, Tumblr, and the video-based social application, Vine. Looking at this graphic, one can tell that the social media environment is getting pretty crowded, and this doesn’t even include other popular sites/applications such as Flickr, Snapchat, Reddit, StumbleUpon, and SoundCloud. However, for those of you that are still not quite sure how some of these sites/apps work or want to impart some knowledge onto peers/family members, this will help you identify the main purpose of the major social media platforms. Author’s note: there was no consumption of alcohol while creating this infographic. Pingback: Beer and Social Media | Snedo – Its Neato! Looks like you missed Untappd? I kept to the most popular ones, but I’ll include it next time! I am agree with you that social media is just like beer and too much intoxicated for the users. They don’t want to leave it in any way however I am amused to read your creative idea of considering it as beer. I think social media has become best place for business advertisement and its time for every business owner to run social media marketing campaign and move their business on the way of development. Pingback: Social Media erklären mit Bier! - Werbung rockt!